Tillage is always a great topic to discuss and it seems that everyone has their own opinion as to what works best. I really enjoy listening to farmers discuss their tillage operations, or in some cases, their move away from tillage to a true no-till system. In 2008, Farm Focus and OSU Extension conducted research to evaluate yield response of corn to different tillage systems. We picked five different tillage systems to evaluate. The most common system used in my area is a fall disk/ripper (10 inches deep) followed by a spring field cultivation (one or two passes at 2-3″ deep). This is the standard that was compared to fall disk, fall shallow strip (6-8″ deep), fall deep strip (10-12″ deep), and spring vertical tillage with a Salford RTS tool (1.5-2″ deep). 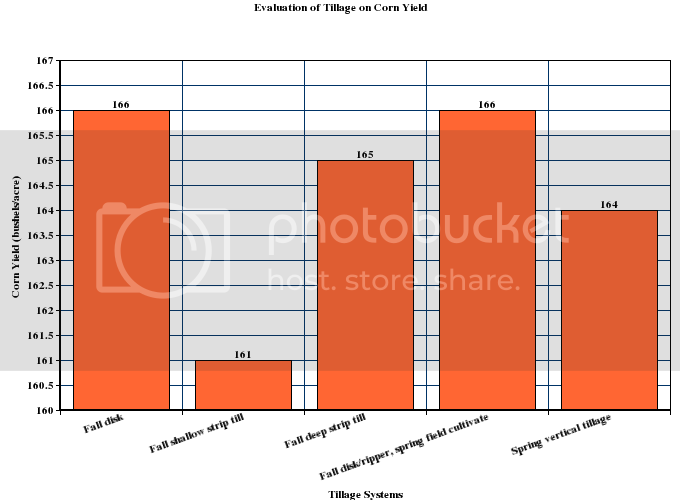 As the graph above indiates, there was not much difference in corn yield from the tillage treatments. In fact, there were no statistical differences (P=0.05) for yield. The test field had a significant amount of stalk lodging caused by high winds, but there was not any differences in stalk lodging or grain moisture that we could document. One tillage treatment didn’t perform better or worse than the other with regards to lodging from wind. The results of this study suggest that there are several tillage practices that produce similar yields. Some of which can reduce the cost of seedbed preparation through less manpower, fuel, and trips across the field. Entry filed under: corn. Tags: corn tillage trial, Farm Focus, no-till, Salford RTS, strip till.